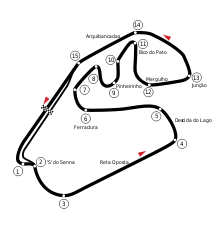 The 1992 Brazilian Grand Prix (formally the XXI Grande Prêmio do Brasil) was a Formula One motor race held at Interlagos on 5 April 1992. It was the third round of the 1992 Formula One season. The 71-lap race was won by Williams driver Nigel Mansell after he started from pole position. His teammate Riccardo Patrese finished second and Michael Schumacher took third for the Benetton team. ^ "1992 Brazilian Grand Prix". formula1.com. Archived from the original on 17 January 2015. Retrieved 23 December 2015. ^ a b "Brazil 1992 - Championship • STATS F1". www.statsf1.com. Retrieved 13 March 2019.